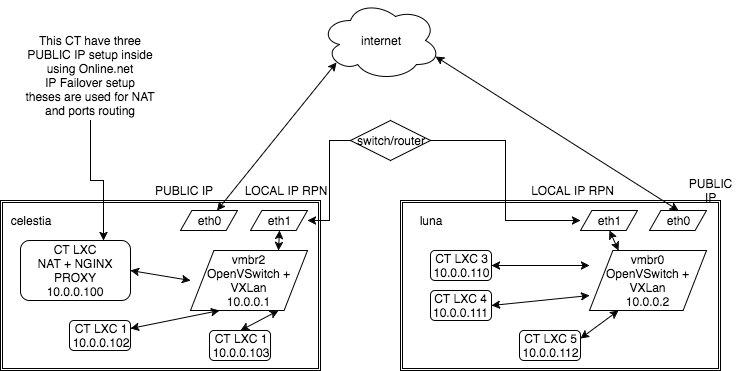 Classic bridges are local only, with OpenVSwitch and automatic VXLan tunelling if you have a private network between your two servers you can have a bridge on each one linked. They will have the same subnet, and servers from one side could reach the other without issue. It's possible to switch from brctl to ovs without issues since there is no required config in the interfaces side of the containers, only setup the bridge and use it. The eth1<->//vmbr0 or vmbr2// is in fact transparent, you don't add it in the bridge, it's juste "transparently" used by VXLan (because you use the tunnel over the private network). You may need to reboot to load OpenVSwitch kernel modules. And you should be able to ping 10.0.0.2 from server 1 and server 1 from server 2.